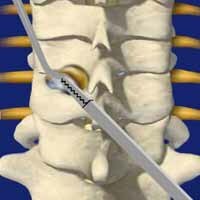 Forminotomies done for pinched nerves, to give more room to exiting nerve root from the spinal canal. When this is done with the help of endoscope it is called endoscopic foraminotomy with very minimal invasive approach and the recovery is quick. If you are certain that an endoscopic foraminotomy is the right treatment for you based on a referral from a doctor or recommendation from another surgeon, the highly skilled surgeons at Advanced Orthopedics are a great choice for getting this procedure done. You may have heard about an endoscopic foraminotomy before and are wondering whether or not it is the right treatment for you. If you are not sure this is the right choice of treatment you should explore other options to make sure that the treatment you get is definitely the one you need. As a part of Advanced Orthopedics' commitment to our patients, we have put together a quick and easy to use tool to help determine whether an endoscopic foraminotomy is the right treatment for you.